The FAMs listed in FAM News are offered for travel agents and their spouses/companions only. The FAMs are not open to the general public. FAMs are date sensitive, which can affect availability. Companion rates on some cruises and/or land travel may be slightly higher than the travel agent rate. Neither FAM News nor eTravel Publications, Inc. guarantee the accuracy of dates, rates, or statements provided by the tour operators, cruise lines, hotels, etc. offering the FAM. 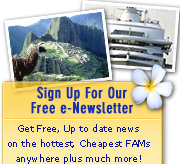 FAM News is only available on the web site at www.famnews.com, and it is neither faxed nor mailed to subscribers. Subscribers can access FAM News 24 hours a day 7 days a week. FAM News is updated on the 15th and 30th of each month, and subscribers are emailed to remind them that the latest issue has been posted to the web site, but subscribers do not need to wait for our email to visit the web site. Neither FAM News nor eTravel Publications, Inc. can be responsible for non-delivered emails, incorrect emails, accessibility difficulties due to subscriber software or browser problems, etc. FAM News subscriptions are individual subscriptions and are only intended for the use by the individual subscriber. Access information must be kept confidential. 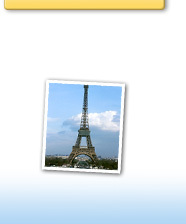 Agency and corporate use must have prior written approval from eTravel Publications, Inc. Copying, reprinting and/or distributing any part of FAM News in any way without express written consent from eTravel Publications, Inc. is strictly forbidden and a violation of copyright laws. © 2009 eTravel Publications, Inc. All Rights Reserved.